This one-dish ham and pasta casserole is a snap to prepare, and your family will love it. 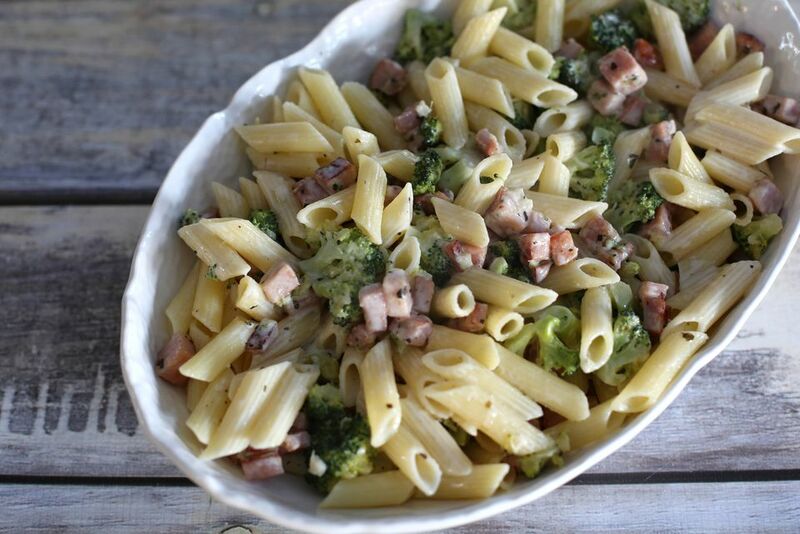 Cook the pasta, quickly steam the broccoli and stir-fry the ham and garlic for a few minutes. The simple sauce is made with heavy cream and Parmesan cheese. The casserole is an excellent way to use leftover ham. Or omit the ham and it instantly becomes a delicious vegetarian dish. Feel free to use mixed vegetables or peas instead of broccoli, or replace the ham with bacon, turkey, or chicken. See the variations for more ideas. Cook the pasta in a pot of boiling salted water following the package directions. Drain in a colander. Meanwhile, put the broccoli pieces in a steaming basket. Bring about an inch of water to a boil in a medium to large saucepan. Put the steaming basket in the pan (above the water, so the broccoli doesn't sit in the water). Cover the pan and steam the broccoli for about 4 minutes, or until the florets are just barely tender. In a skillet or saute pan over medium heat, melt the butter. Add the ham and cook, stirring, until browned. Add the garlic and cook for 1 more minute. Add the basil, cream, and Parmesan cheese. Bring to a simmer over low heat and continue cooking for about 1 minute. Taste and add salt and pepper, as needed. Combine with the drained pasta and toss. Heat through. Transfer the pasta mixture to a serving bowl and toss again at the table just before serving. Serve with extra Parmesan cheese, a tossed salad or Caesar salad, along with crusty rolls or bread. Replace the ham with diced Canadian bacon or about 6 to 8 strips of cooked diced bacon. Turkey ham may be used as well. Replace the broccoli with steamed or microwaved frozen green peas. Make the casserole with turkey or chicken instead of ham, or omit the meat altogether and add more cheese, if desired. For a gluten-free diet, serve the dish with gluten-free pasta.